Chemical Wedding has released a major update to their already indispensable Artemis Director’s Viewfinder ($29.99). Version 6 includes a welcome interface re-design, support for AirPlay (Apple’s wireless video protocol) and the ability to store meta-data filled snapshots in a built-in gallery. 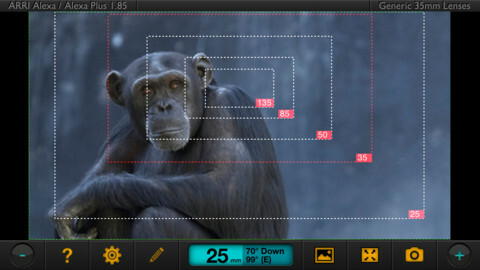 If you’re not already familiar with Artemis, it’s an app that turns your iPhone’s (or iPad’s) built-in camera into a full-blown, feature rich director’s viewfinder — a gizmo that directors and cinematographers use to line up shots without having to lug a camera all over set. Even though the app has received a lovely face-lift, existing users will feel right at home. The only really new area is the app’s image gallery. By tapping on the photo icon, you’ll be brought to a scrolling list of your stored shots, each displaying its relevant meta data (camera, lens, etc.). Naturally, you can share the images and data. This swanky new version of Artemis requires that your device be running iOS v.6. For most, that’s not a problem. But, if you’re running a newer jailbroken device, you’re likely stuck on iOS 5 for the time being. While this update is for the iPhone only version, I’m guessing an update to the iPad version (Artemis HD) can’t be far behind. Update: Chemical Wedding has just released version 6.1 that adds compatibility with iOS 5. Jailbreakers rejoice! If you don’t already have this app, get it! It belongs on every filmmakers home screen. If you’d like to learn more about it, I cover the app in much greater detail in the book.